I have not been consistent in blogging these days and have almost lost touch with many of my dear blogger buddies and wonderful readers lately. Blame it on me, even if I have excuses like not getting much time to post while managing work and household together, believe me I have missed all the fun being here and had been trying real hard to find some time to blog. It is not the laziness that kept me away from here but three pair of starving eyes which gives me a wierd look when they see my intention to click pictures when they are are waiting eagerly for having something from the the time they are back from school/office just dont let my motherly instict to click any pictures. The sun light is not helping me in anyway as well, by the time I leave office it is already dark. But yes, since I've moved to a new job which is pretty much close to where we live and I have started commuting daily rather than travelling over the weekends, I am getting sometime to cook and click pictures which I am really happy about. I hope I will be active with blogging from now and will definitely make time to hop onto all my blogger buddies post. I request all my wonderful readers and blogger friends to please stay connected and give me the same support and encouragement which you guys gave me before. 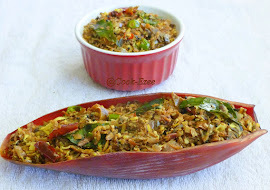 Coming onto today's recipe, its the again one of the most family favorite - Fish Biriyani. 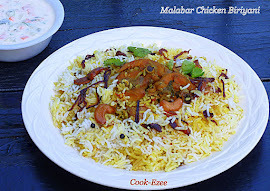 I have already posted a Fish Biriyani, but the procedure for making this Fish Masala is a lot different which gives this biriyani a very unique taste. I've used Tilapia Fish fillet for making this biriyani, but you can use fish of your choice but try to use fish with less bone and more meat. So make it home today and Enjoy with family and friends!!! Onion sliced very thin and deep fried till light brown. Clean and cut tilapia into small bite size pieces. Wash once or twice. Make a marinade with ¾ tsp turmeric powder, 1 tsp chilly powder, crushed fennel and salt. Marinate the fish and set aside for an hour. Heat up a skillet/tawa, pour 1 tbsp oil, shallow fry the fish pieces on both side and keep aside. Grind the 'To Grind' ingredients to a smooth paste and set aside. Pour 2tbsp of oil in manchatti/earthern ware(or any non-stick pan), add crushed ginger-garlic, curry leaves and saute for a minute or two. Add onion, green chilly, salt and saute well in medium heat till the onion turns transkucent. Add tomato and saute well till the tomato is fully cooked mashed up. Add ½ tsp turmeric powder,½ tsp chilly powder, coriander powder and garam masala and saute well to mix. Add the ground paste and mix well. Add water to get required consistency, stir well and let it boil. Simmer the heat to medium and add fried fish pieces. Mix well with masala and let it boil for another ten minutes. Add coriander leaves and take off the stove. Heat up a thick bottom pan, pour ghee. Add cardamom, cinnamon stick, cloves, bay leaves and saute for a minute. Pour water, salt and whole pepper. Let it boil. Add rice, with a saptula stir well till the bottom of the pan. Simmer the heat to medium, cover with a air tight lid and let it cook till the water is absorbed. Take it out of the stove and give it a gentle stir. Let it cool down for a while say let the steaming heat subside. Move to two-three platters so that rice do not stick to each other and will be nice and fluffy. Heat a wide vessel, keep in low heat, pour 2 tsp of oil, spread half the rice on the bottom of the vessel, top it with fish masala gravy, top with fried cashews, raisins, fried onions, coriander leaves and few drops of saffron milk. Repeat the process with remaing rice, masala, fried cashews, raisins, onions and saffron milk. Cover with an air tight lid and cook in low heat till steam starts to release from the sides of the pan. Take them out to individual serving plate, garnish with more raisins, cashews and fried onion. Serve warm with pappads, pickles, chutney and Raita. Biriyani looks so delicious!! Welcome back...hope you are happy with new job and in free mind.Have a great day! Very tempting and yummy biryani. Looks very delicious n yummy!! Happy Christmas to u n fly!! Thanx for ur post nd giving us a hugefull information, plzz tell me wht is the main benifit of FO & WP .. ??? Wow...mouthwatering biryani with tilapia fish, very yummy Pratibha. Fish biriyani looks delicious love it. Sounds healthy n yummy !!! Nice recipe! looks very delicious. we have biryani today,which seems like our weekly sunday lunch! will try your recipe next time. A prefect briyani for a sunday lunch. Inviting. wow... delicious biryani... mouth watering!! mmmm....yummmy!! Even I've made the same fish biriyani last year. tastes awesome right?